LinkedIn reports that 79% of all members are looking for a role, or open to the idea of a new role. 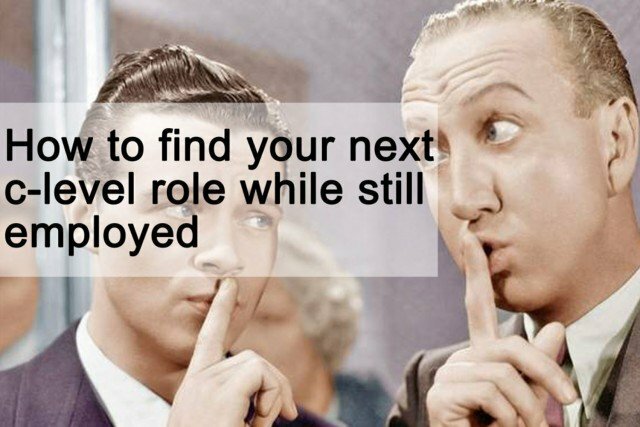 So what if you’re currently employed, don’t want to rock the boat at work, but want to start exploring the idea of landing a fresh new role? It’s often seen as a risky thing to do, but there are ways that you can mitigate the fact that you won’t be broadcasting your intentions via your user headlines or summary. In this article we’ll explore 7 ways that you can quickly gain traction on LinkedIn, attract the right visitors to your profile, and nurture the conversations that will help you land your next senior executive role, faster. There’s no way that you can sit back even after creating the most attractive, keyword focused LinkedIn profile. Fact. While having a ‘complete’ profile is a good start, it only scratches the surface of what you need to be doing on a regular and committed basis. Of course, you’ll also be concerned that increased activity may come to the attention of your colleagues or employer, so we’ll only cover activities that help keep you ‘below the radar’ as far as possible, so the speak, but bear in mind that there are no guarantees that I can make; all we’ll be doing is reducing the risk of exposure by not broadcasting your intentions in your profile headline or summary. Research re numbers of recruiters vs. numbers of candidates using LinkedIn are staggering, even today. 94% of recruiters are active on LinkedIn, but only 36% of candidates are, and 89% of all recruiters report having hired someone through LinkedIn. So for any senior executive exploring their options, can you see how vital it is to treat LinkedIn as a key tool going forward? The very best roles, including the hidden, or unadvertised jobs (usually the best roles), are found by taking the time to switch your thinking from that of posting your CV/Resume to jobs boards and seeking out advertised roles, to nurturing relationships with new contacts, growing your network, and helping as many people as you can along the way (more about mind-set later). The latest figures quote an average LinkedIn user as spending 17 minutes a week on LinkedIn… 17 minutes a week! This is quite an old stat, and some sources report LinkedIn users as spending even less time than this per week. I would propose that you spend at the very least an hour a day, growing your network via selected connect requests, as it’s growing your network which will help unlock opportunities, and this growth can’t be achieved in any meaningful way unless a significant amount of time is applied to the task. Accessing new contacts via LinkedIn groups is a good way to start, and I’ve outlined here some ways to ensure that you’re not wasting your time in groups. Whether you decide to use a free CRM system, a spread sheet, or a ‘little black book’ approach, it’s vital that you begin and continue to track the conversations and connections that you make on LinkedIn. A straightforward menu system of name, company (if relevant), email address, and importantly a note of the last conversation that you had with the individual are key. Another, slightly more unwieldy currently, is to use LinkedIn’s own tagging system; using this system you can organize recruiters and other contacts into relevant tags (think folders), and you can create as many as you wish. Personally, I advocate a combination of a simple spread sheet and the LinkedIn tagging system. One of the key aspects to ‘get’ with all of the networking and contact growth that you’ll be working towards, is the mind set of ‘win-win’; so if for example a peer gives you a few useful headhunter or recruiter contacts, and you find yourself at a loss as to how you could help them, simply ask, “Is there anything I can do to help you?”. At least in this way you’re showing willing and entering into the social media spirit; things do have a habit of coming back to you by adopting this giving approach to networking. There are other ways to raise your visibility, such as writing and posting articles, but I don’t intend covering them here, as the focus of this piece is on being a touch more low key. I’m not for one minute suggesting you’re complacent, as you’re obviously looking for a move for a reason, but our own independent research shows that there’s a disparity between how senior level candidates perceive themselves and their market ‘readiness’, as against how top headhunters and recruiters see them. So it’s good to be aware that a high level of preparation, including CV/Resume and interview skills are not only expected, but can really make the difference to being presented to a headhunter’s client. What you’ll also want to do is to minimize the amount of announcements that appear in your and your contacts feeds. The profile settings page can be accessed via the tiny picture of yourself to the top right hand side of the various LinkedIn menu options. I suggest turning off selected options in your settings that will prevent broadcasting any changes that you make to your profile, so that changes you make to your profile will not be broadcast to the world. We publish independent recruiter-led research, and other tools to help you in your senior executive job search, so please take a look at our website, and take some time absorbing the information, and while you’re there perhaps sign up for our exclusive resources, where you can access valuable career insights.